San Francisco is home to a large collection of historic tramcars that operate daily on the main trunk route from Fisherman’s Wharf to Castro, known as the ‘F’ Line. 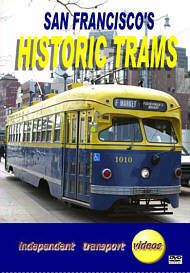 The trams are painted in liveries that represent various American cities. In our video programme we also see trams from the cities of Milan, Italy and Melbourne, Australia. The bulk of the historic fleet consists of PCC cars built during the 1940’s and 1950’s. We start our programme at the busy Fisherman’s Wharf area of the city. Here the trams turn for the run back to Castro. Our journey takes us along the Embarcadero past the ocean terminals and recreational piers that line San Francisco’s waterfront. The impressive Ferry Building is reached where the trams turn by the Market Street Railway Museum. Our journey continues at the start of Market Street, the busy financial area of the city, were we see the historic trams sharing the road with buses and trolleybuses. As we make our way along Market Street we pass through downtown San Francisco and then join a tram for a ride to Castro. Here we can see the high standard of restoration work that has been carried out on these iconic vehicles. The bohemian Castro district provides a interesting backdrop for filming were the trams terminate. The contrast with the Italian and the PCC trams is most noticeable and provide a good subject matter for our cameras. From Castro we make our way back along the ‘F’ line for a brief pause at Van Ness before travelling on tram 1061 in Pacific Electric livery to Fisherman’s Wharf. We conclude the programme with atmospheric night scenes captured on Market Street and at the Ferry Plaza. To travel on these historic trams it is like going back in time to a bygone era – so enjoy the experience!